Outdoor workers in muddy or potentially messy conditions can wear wellingtons or safety boots to protect their feet. But what about those working indoors who need protection from fluids, food or other substances which might end up on the floor? The answer is to wear a pair of washable clogs, often teamed with scrubs. 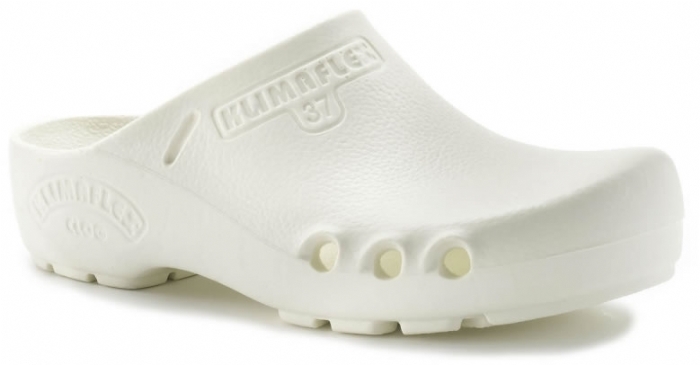 Washable clogs are ideal protective footwear for people who work in the medical or catering field. They are easy to keep hygienically clean and remain comfortable on the feet for long shifts where much of the time is spent standing or walking. Anyone who has ever worked a long, tiring shift like that will appreciate the 30 years of experience which goes into making every pair of Toffeln clogs. Aston Workwear offers a wide selection of protective footwear designs from Toffeln. We stock clogs, shoes and boots, so whatever the requirement or professional preference it's likely to be available. In operating theatres and wards the world over, moulded washable clogs of various makes are required as protective footwear. For workers in the food preparation business, a fully closed loafer style shoe or even a boot would be a better and safer option. We stock those here at Aston Workwear too, in several different colours as well as the utilitarian plain black or white options. Some ranges are also available in half sizes, but remember, our account handlers and customer service staff are able to help track down those difficult-to-find items should their help be required. The ideal clothing to wear with a pair of washable clogs is usually hardwearing, easily washable and tough. Chefs’ whites or coloured medical scrubs are the perfect match, as these uniforms are both designed to be hardwearing and long lasting, able to be washed and worn, then washed and worn again as often as necessary for hygiene requirements. Unlike chefs’ whites, scrub sets are available in many colours so organisations can choose to have their staff wear different colours by team, speciality or even simply corporate identity. However, just like chefs’ whites, scrubs are designed to be flattering to no one but protective of everyone. They are simply made, with drawstring trousers and short sleeved v-neck tops, almost indestructible, and when finally past their best, can be replaced quickly and cheaply. Green scrubs (usually abbreviated simply to ‘greens’) are routinely worn by surgeons and operating theatre staff around the world, with an apron and gloves for added protection. Blue and other colours (obviously shortened to ‘blues’) can be used to denote support staff, while pink is often a reserve colour designed to prevent theft. In some areas of the world, climate permitting, scrubs in a delicate shade of pale pink are standard prison issue clothing. Especially as hardened criminals find pink particularly embarrassing to wear, given its feminine associations, the scrub set has especially found favour with those prison governors whose beat falls in hot US states. No matter the clientele or staff required to wear the scrub sets and washable clogs, Aston Workwear can help meet any organisation’s requirements. We might not be the biggest name in the supply of scrubs and clogs, but we pride ourselves on being one of the best online.